The Phillies have signed left-handed pitcher Jamie Moyer to a two-year, $16M contract. 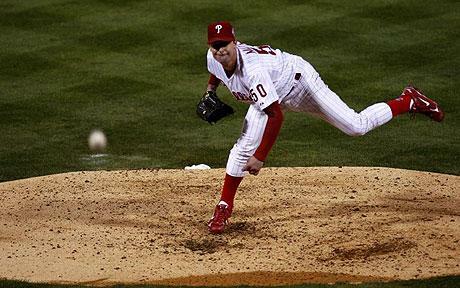 Moyer joined the Phillies in 2006, and last season finished with a 16-7 record and 3.71 ERA. Analysis: Both parties wanted to comply, and they finally got their wishes. Really, I didn’t mind if Moyer returned and no additional moves were made to bolster the rotation. But frankly, $16M is a lot for Moyer, a 45-year-old who could either give you a 3.71 ERA, or a 5.01 ERA. This move also may take Derek Lowe off the Phils’ radar, and seemingly the starting rotation is set. Chan Ho Park, also acquired today, could add depth or come out of the bullpen. The good thing is the Phils have nine options for five Opening Day rotation spots. The bad thing? Only one is a sure thing to perform well.